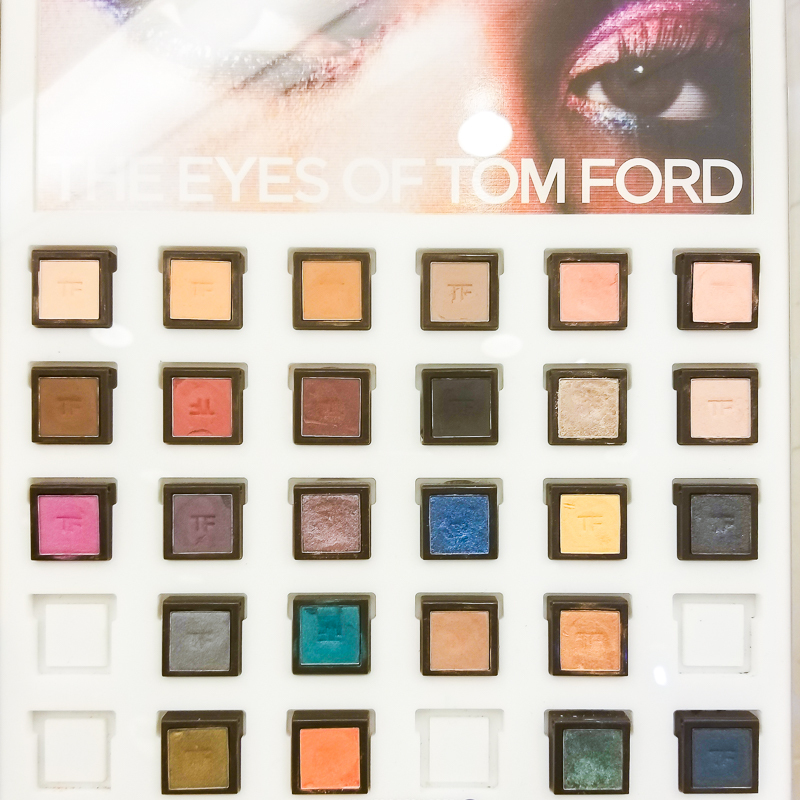 Tom Ford eyeshadows are a mix of textures, some better than the others. 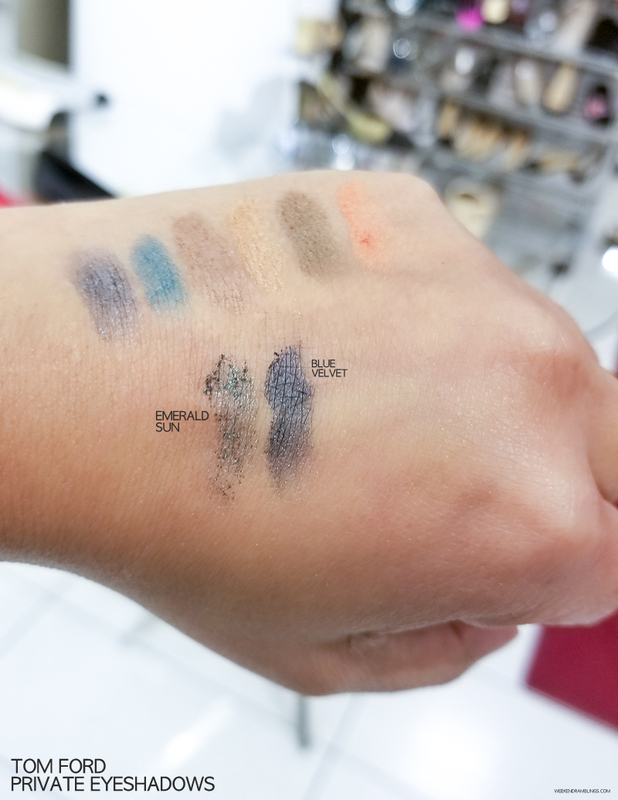 I prefer pigmented matte and velvet/satin finish eyeshadows, so not surprisingly, I would pick those among the Tom Ford eyeshadows that I tried. 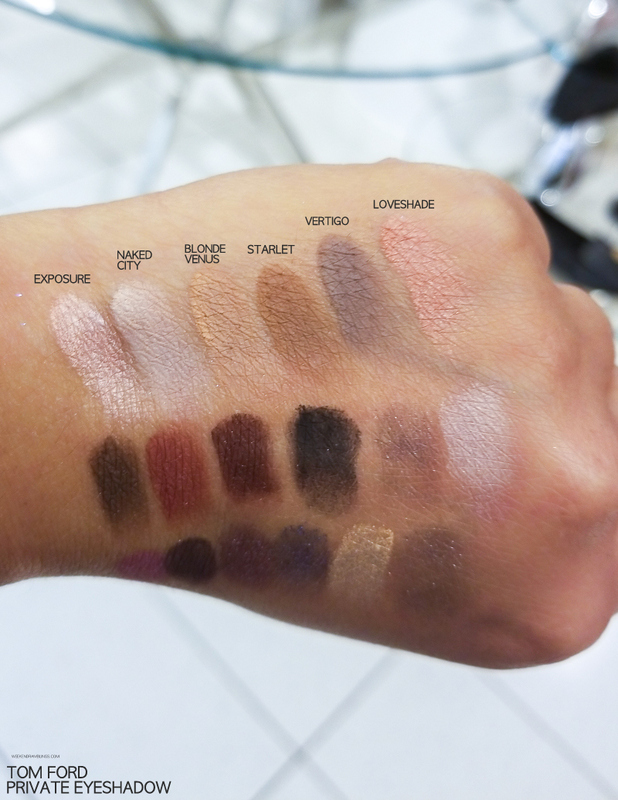 Blonde Venus, Starlet, Vertigo, Loveshade, Dark Victory, Agenda Rouge, Video Tape, Night Cast are easy to like for someone with medium-darker skin tone like mine (and if you are always picking warmer-toned browns like I seem to). Among the more vibrant shades, Photographic and Infrared really stand out, but I have a feeling they would perform better with a dampened brush rather than just patted on. As for the glimmery, sparkly shades like Emerald Sun, Tempete Blue, or Black Onyx (especially this one) - the colors look so rich and dark in the pan and Emerald Sun even feels like soft pigment to touch, but they go on as sheer washes on skin. 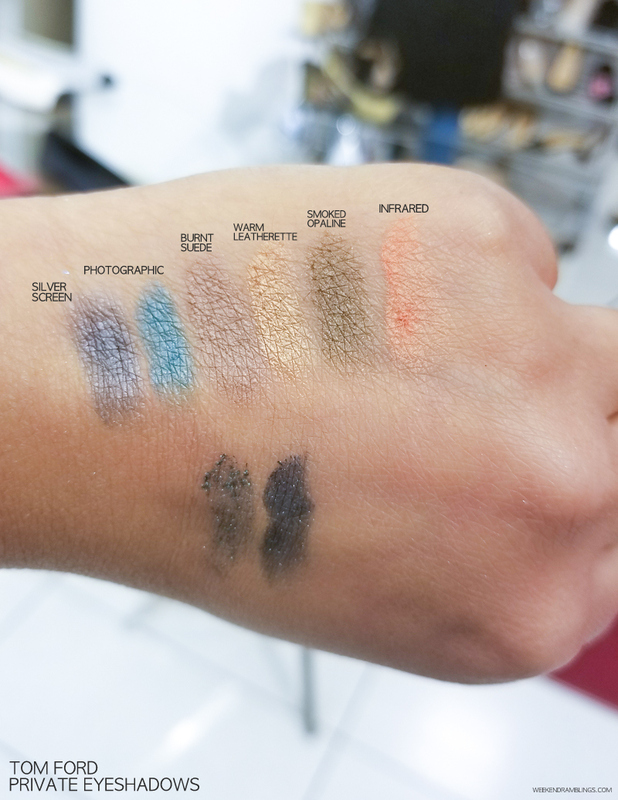 Personally, I don't like such shades/textures, but I have seen these textures used beautifully by a lot of makeup artists. At $36 each, these are pricey eyeshadows, but Tom Ford isn't exactly known for being inexpensive, and I think the packaging of the products does live up to the price. The eyeshadows are housed in small, beautiful compacts - described as clutch-sized, but I think a lot smaller than regular clutches 😛 - and they would definitely add a touch of luxury to any makeup collection. 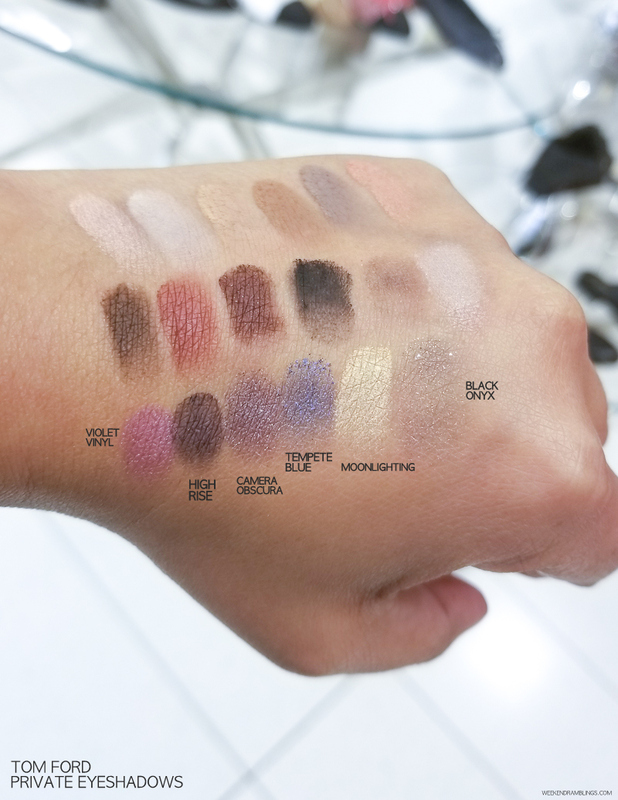 I have splurged on quite a few products in the past mostly because of the luxurious packaging, and I prefer much simpler, easier-to-organize and functional products now, but I think some of the colors are quite pretty, and I wouldn't mind picking up one or two shadows from this range.